Mangaluru, Jan 8, 2019: For him Art itself is Life and continues to be so even at this ripe age. He has just completed 99 years and has stepped into the 100th year of his life. Hiriyadka Gopala Rao who is famed as the Maddale Mantrika, or Maddale Maestro, is an all-rounder in the field of Yakshagana though his most cherished contribution is as a Maddale exponent. 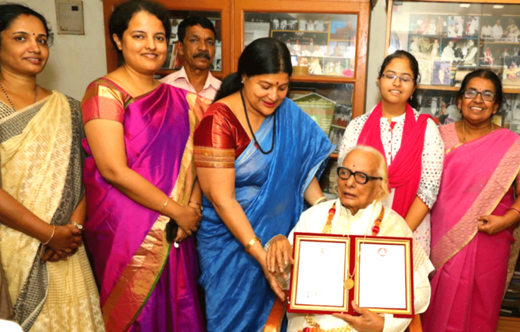 Rao was befittingly conferred the Kannada Rajyotsava Award of the state government for his incredible achievements to the field of art. Born on December 15, 1919 to Sheshagiri Rao and Lakshmibai couple of Hiriadka, for Gopala Rao his father himself was his first Guru. 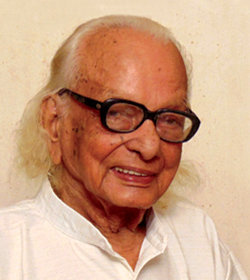 Sheshagiri Rao was an Ayurvedic doctor and a Yakshagana artiste too. Gopala Rao who studied upto fifth standard at Anantheshwara Lower Primary School in Udupi, could not pursue education beyond seventh standard owing to various reasons. As a lad he was more interested in Yakshagana and learnt the intricacies of the art from Hiriadka Pattanashetty Nagappa Kamath. That he learnt Yakshagana secretly without the knowledge of his father, revealed the extent to which he loved the art. He even learnt Maddale under the tutelage of Perdoor Venkata Rao. Later he performed some small roles in Hiriyadka Mela. Rao’s association with Srinivas Uppoor, the father of renowned Bhagavatha Narayana Uppoor, also helped him in mastering Bhagavathike. He is proud of the fact that he also learnt Yakshagana under the renowned Dr K Shivarama Karanth. It was at Karanth’s behest that he taught Yakshagana to American national Martha Bush Aschan who had come all the way to India to learn it way back in 1969. 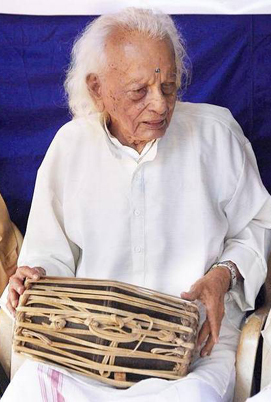 Gopala Rao was part of Mandarthi Mela for almost three decades. To his credit goes the formation of the first Yakshagana troupe in Hiriyadka. At a time when Jodatas in Yakshagana were very popular it was Rao who introduced a Maddale which was as long as a forearm instead of the traditional 30 inch long Maddale. Even today the large Maddale is used until midnight in Yakshagana while the small Maddale is used past midnight. Gopala Rao who had learnt about traditional medicines from his father even used to treat patients suffering stroke and epilepsy. He had to later stop practice due to tougher norms in the form of various regulations. During his association with Shivaram Karanth he involved himself with the Kinnara Nritya and Mooka Nritya of Karanth and even conducted Yakshagana training including Maddale classes at Ambalpady and other places. When the MGM Yakshagana Kendra was started in 1971, Rao was among the three teachers who offered their services there.